My first published novel, The Forgotten Legion, which has done very well since its release in hardback in May 2008. Sales reached nearly 10,000 copies, making it the 8th best selling debut hardback fiction in the UK in 2008. World rights to The Forgotten Legion trilogy were sold to Rosie de Courcy at Preface/Random House. US rights sold to St. Martin’s Press (3 book deal); Italian rights to Edizioni Piemme (3 book deal); Russian rights to Exmo (3 book deal); Spanish rights to Ediciones B (all 3 sold individually); Greek rights to Anubis (3 book deal); Turkish rights to Artemis (3 book deal); Dutch rights to Athenaeum (Book One only). Dramatic rights with Intellectual Property Group. 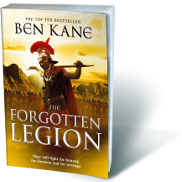 The paperback of The Forgotten Legion came out on the 16th of April 2009, and with the gods’ help, it’s also doing well – with nearly 50,000 copies sold so far. It did so well in Waterstone’s that they made it one of their ‘Books of the Year’ for 2009 and it stayed on the ’3 for 2′ stands until Christmas. I really know what you mean about not liking Rome. I have a bit of a love/hate relationship with it. I hope you enjoy the Forgotten Legion books. Saludos. Ben – just finished Forgotten Legion 1. Cracking good read! Picked up all three at a local market and am now starting on number 2. Slight niggle (I’m retired Ermine Street Guard and fussy about these things) – can you have your urchins throw something other than tomatoes? Not known in Europe until 16th century. @Adco: Cheers for your message – I’m very glad that you enjoyed the first book. You must have picked up one of the very first editions. It’s to my eternal embarrassment that that got into print. The worst of it was, I knew that tomatoes weren’t introduced until the Spanish came back from Latin America. I wrote that chapter AFTER my book had been accepted by a publisher, though, and it was written really fast, and only edited once at most – unlike the rest, which had been edited 50-60 times. No excuse, I know, but there you go. P131, line 2: replace ‘a ripe tomato’ with ‘an overripe plum’. P131, line 4: remove ‘red’. P131, line 6: replace ‘tomatoes’ with ‘plums’. That’s from my note to my publisher – soon after the hardback had gone to print, worse luck. Still, I hope that these days I don’t make anything like the same mistakes. I hope you like my Hannibal books, for example, the battle of Cannae, which is in Fields of Blood. Ancient sources all the way there. ESG – good for you I’ve seen them in action many times. PS: Could I ask that you buy some of my books in the future, or borrow them from the library at least? Readers who buy my books allow me to keep writing. Thanks and best wishes to you. Ben. Just finished the forgotten legion! And all I could say was what an amazing book! I must admit the beginning did start off slow but then I really got into it! As a reader of many Roman books and lover of the Eagle series by simmon scarrow I really enjoyed this book! I must sadly admit I have not read very many books during this time period in roman history manly the ones I read were during the Nero, Claudius, Vespasian time period. Although I knew the history of this book I did learn quite a lot about the tension in Rome and the transition to an empire. I have heard rumors that this book would be made into a movie, although I know they are only rumors I am trying to get more and more people to read the books. I gave it a review on goodreads and recommended it to my 104 friends on goodreads too. If you could give me an update on the movie plans and anything else about this series would be appreciated. @Hayley: Sorry, been away on holiday, and trying to finish new book. No plans to make the Forgotten Legion into a film, that I know of! Many thanks for your kind words and thanks for spreading the word. You should definitely make it into a film I’m sure it will be brilliant. P.S. My version has a different cover photo to the one above is mine a older version? Hi there, and so sorry for not getting back to you before now. Yours must be an older version, yes! Thanks for posting. Ben. Hi Ben, I just finished your Forgotten Legion Trilogy and by Jupiter I can’t thank you enough for writing these. Thanks again for a great read, I ordered a copy of Hannibal: Enemy of Rome and I can’t wait to get started! @Ryan: many thanks for your message. I’m glad you liked the trilogy. I have no plans to write another Forgotten Legion book, however. Too many stories to write! Enjoy Hannibal – and if you ever have the time, Amazon or Goodreads reviews (or both!) are superhelpful. They don’t have to be long either. Best wishes to you – Ben.